For cancer prevention, AICR research shows that regular coffee drinking is one way to lower risk of liver and endometrial cancers. Now two large studies suggest that coffee drinkers may live longer than non-coffee drinkers, having lower risk of dying from many cancers – as well as other chronic diseases. Both studies were published this week in the Annals of Internal Medicine. About three quarters of Americans drink coffee every day, making it especially important to understand how this beverage affects health. Large studies in both the US and Japan have previously pointed to health benefits of drinking coffee and to a lower risk of death from all causes. Yet there is little data on ethnic and European populations. In one study, scientists analyzed data from more than half a million people across 10 European countries to investigate the effect of coffee consumption on risk of mortality. Participants were all over and the age of 35 and part of the European Prospective Investigation into Cancer and Nutrition. People’s diets were assessed using questionnaires and interviews, with the highest level of coffee consumption (by volume) reported in Denmark (almost 4 cups per day) and lowest in Italy (less than 1/2 cup per day). Coffee peparation methods varied, from an espresso in Italy to a cappuccino in the United Kingdom. After adjusting for lifestyle factors recognized to have an effect on mortality, such as diet and smoking, drinking more coffee linked to a reduced risk of death overall, particularly from circulatory diseases and diseases related to the digestive tract. The results were similar across all the European countries, even with variable coffee drinking habits and customs. Decaffeinated coffee had a similar effect yet the study points out that decaffeinated coffee drinkers may have been consuming caffeinated coffee earlier in their life. 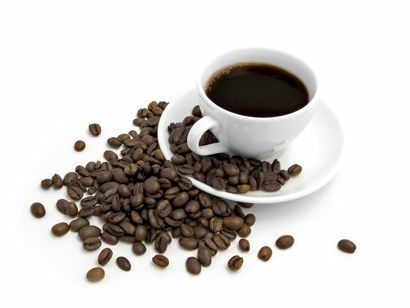 This study did find that coffee consumption increased risk of ovarian cancer mortality. There is no known mechansims for this, write the researchers, and it requires follow-up. AICR's latest report on ovarian cancer did not find a link between coffee consumption and ovarian cancer risk. Read about the latest research on the compounds in coffee and how it relates to cancer risk. In the second study, researchers used data from the Multiethnic Cohort Study group, which states it is the most ethnically diverse study examining lifestyle risk factors that may lead to cancer. The study looked at data from 185,855 African-Americans, Native Hawaiians, Japanese-Americans, Latinos and whites. Participants ranged in age from 45 to 75 when they entered the study. Everyone answered questionnaires about how much coffee they drank, along with other diet, lifestyle, and related medical history. Every five years participants updated their coffee drinking and other lifestyle habits. They also reported whether they drank caffeinated or decaffeinated coffee. The follow up in this study was also 16 years, and, drinking coffee was associated with a lower risk of death due to heart disease, cancer, stroke, diabetes, and respiratory and kidney disease for African-Americans, Japanese-Americans, Latinos and whites. Those who drank a cup of coffee a day were 12 percent less likely to die compared to those who didn't drink coffee. This association was even stronger for those who drank two to three cups a day -- an 18 percent reduced chance of death. This link was after taking into account age, smoking habits, preexisting disease, and other risk factors for earlier death. The link with lower mortality was also seen here whether people drank regular or decaffeinated coffee. As both sets of authors point out, the findings show an association only and it’s not possible to say drinking coffee will lengthen life. Yet finding a similar pattern across different populations gives stronger biological backing to the argument that coffee offers health benefits for many ethnicities and races. More research is needed to determine amounts. The EPIC study found that up to three cups of coffee a day can lower risk. While research isn't clear on the optimal amounts of coffee for health benefits, there are some reasons people may need to avoid or limit coffee. Coffee contains a number of compounds well studied for their cancer-protective and other health benefits, including caffeine, diterpenes and cafestol. In the European study, the researchers analyzed metabolic biomarkers of a subset of 14,000 people. They found that coffee drinkers may have healthier livers overall and better glucose control than non-coffee drinkers. Both studies are observational and have several limitations, including self-reporting coffee intake. According to both groups, more research is needed to find out which of the compounds in coffee may be giving a protective effect or potentially benefiting health. The study investigating The Multinational Ethnic Cohot was funded by the National Cancer Institute. The study investigating EPIC was funded by the European Commission Directorate General for Health and Consumers and the IARC.